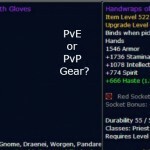 Pve Gear Vs. PvP Gear, Can Your Use One for the Other? Guides » Gear » PvE Gear Vs. PvP Gear, Can You Use One for the Other? Clearly the Grevous chest is better for PvP and the Lightning chest for PvE, but the PvP piece has that Haste edge and a nice PvP bonus when you get the set, plus the Crusader strike bonus. The PvE piece has some applicable PvP bonuses.For PvE the PvE piece’s bonuses are useful, but only the one 4 set bonuses on the PvP piece is useful. For PvE, the PvE weapon is better since you can drop a Crystallized Terror into that sha-touched slot, giving it a 477 Str advantage and the PvP Power doesn’t count. Clearly, for PvP, there’s no contest. That 6195 PvP Power far outweighs the 477 Str. 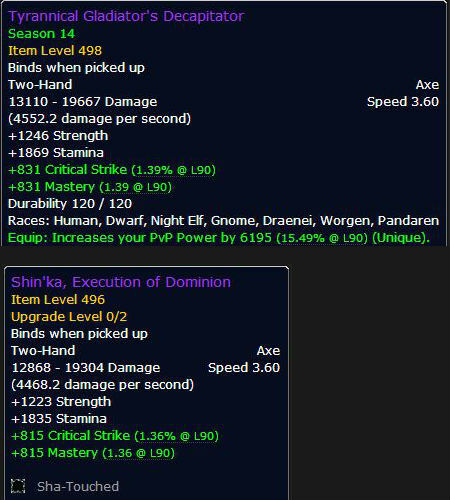 Note that the Stam, Spell Power, and DPS numbers are basically the same on both items. For PvE it’s pretty close. The gem socket makes up for the stats edge on the PvP item, giving the PvE piece a small edge. For PvP it’s no contest. 7,775 PvP power obliterates the PvE item. One last comparison… We’ll stick to the 522 gear, for Priests, the comparisons should be similar with lower level items or other armor types. Currently there is no higher PvP item level. Note that Stam and Int are the same and both have the same socket bonus. Healers only get half the value of PvP Power, as compared to damage dealers, but that’s still nearly 1k PvP power for the set bonus on the Grievous gloves. Set: Holy gets a big chakra reduction, Disc gets a change to Spirit Shell. Set: P of M boost. Aside from the PvP Power the set bonuses on both look pretty good. Psychic Scream won’t be much use in raids and such, but the other bonuses will. For PvP: The Grievous item obviously has an strong edge, esp with the Psychic Scream cooldown. Por PvE: It looks like either piece would be just fine. 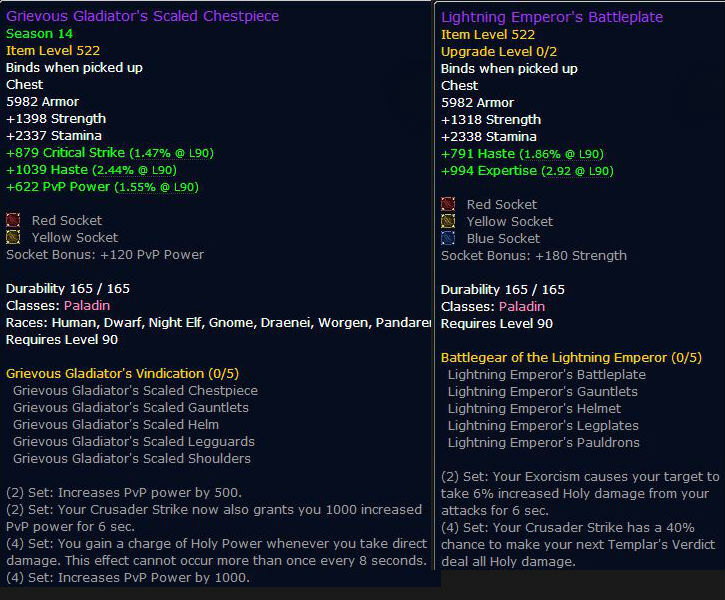 Generally speaking it looks like PvP gear, if the item levels are at all close, is definitely superior for PvP. For PvE (raids, instances, etc.) the PvE gear is better, but not by a lot. You could get by with PvP gear as a starter set for your heroic dungeons and early raids, then upgrade. Once upon a time, the PvP gear was definitely inferior to the PvE gear for PvE situations. This is no longer the case. Once upon a time the reverse was also true, as PvE gear had no Resilience and so the survivability was much less. 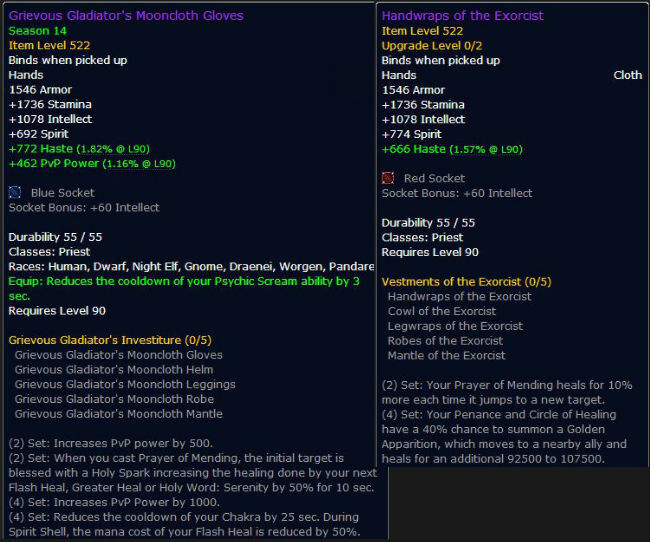 Nowadays (patch 5.4) Resilience is 72%, regardless of gear, so PvE gear doesn’t take quite the hit. You could gear up in, say, the Timeless Isle, hop into the BGs, and do Ok while you get into the Tyrannical Honor gear. That would be much better than using your level 90 green gear from questing and even better than the, very expensive, Crafted Malevelent gear set on the Auction House. In World PvP (events, battles, ganking) the much higher item level available with PvE gear will make it more effective than PvP gear, with the possible exception of the weapons. The big Stamina edge will help out, too. PvE gear is, as of this post, topping at item level 553 and can be upgraded to 560. That should give you a nice edge over the 522 Gladiator set. In instance PvP (Battlegrounds, arena) the PvE gear is down-rated (to about 500 as I write this) and the PvP gear will be much better. 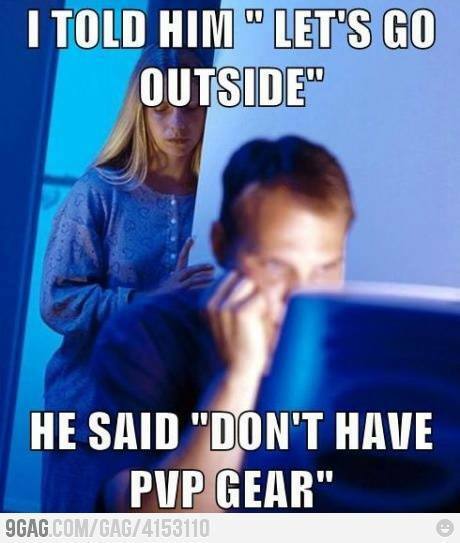 So what do you think about PvE Gear Vs. PvP Gear? Pilgrim’s Bounty Event Guide Beef Up Your Arms Warrior – 8 Steps to Maximum Damage!